Moody’s Investors Service and Fitch Ratings affirmed their AAA credit ratings on Aug. 2, the day President Barack Obamasigned a bill that ended the debt-ceiling impasse that pushed the Treasury to the edge of default. Moody’s and Fitch also said that downgrades were possible if lawmakers fail to enact debt reduction measures and the economy weakens. Asian investors are likely to retain their Treasuries holdings for now, with options limited by the region’s foreign-exchange rate policies. Japan, the second-largest international investor in American government debt, sees no problem with trust in the securities, a Japanese government official said on condition of anonymity. Policy makers from China to Japan to Southeast Asia are lured to Treasuries as a result of efforts to stem gains in their currencies against the dollar, which would impair export competitiveness. China has accumulated $1.16 trillion in the securities and the nation’s official Xinhua News Agency said in a commentary that the U.S. must cure its “addiction” to borrowing. S&P put the U.S. government on notice on April 18 that it risked losing the AAA rating it had since 1941 unless lawmakers agreed on a plan by 2013 to reduce budget deficits and the national debt. It indicated last month that anything less than $4 trillion in cuts would jeopardize the rating. “The minute you start downgrading away from AAA, you take small steps toward credit risk and that is something any country would like to avoid,” Mohamed El-Erian, chief executive and co-chief investment officer at Pacific Investment Management Co., said in a Bloomberg Television interview before the announcement. Ten-year Treasury yields fell to as low as 2.33 percent inNew York yesterday, the least since October. Yields for the nine sovereign borrowers that have lost their AAA ratings since 1998 rose an average of two basis points in the following week, according to JPMorgan. Members of the TBAC, as the committee is known, which met Aug. 2 in Washington, also discussed the implications of a downgrade of the U.S. sovereign credit rating. “None of the members thought that a downgrade was imminent,” according tominutes of the meeting released by the Treasury. S&P gives 18 sovereign entities its top ranking, includingAustralia, Hong Kong and the Isle of Man, according to a July report. The U.K. which is estimated to have debt to GDP this year of 80 percent, 6 percentage points higher than the U.S., also has the top credit grade. In contrast with the U.S., its net public debt is forecast to decline either before or by 2015, S&P said in the statement yesterday. This move is a surprise to me as I did not believe the S&P would have the balls to do so . This is bad for the markets, expect to see wild gyrations in the Dow .This is the kind of move that could cause the Dow to take a further nosedive down to about 9400ish a 2000 point drop .It’s time to get out or get some more insurance! The new rating of AA+ is not justified with all of the printing going full blast the Americans are already broke many times over and should really have a rating of Junk status . But if this happened we could see global war. we just do not have the earnings ability! Time for the government to declare we are going to default! the public services in the next few months? Dominant Social Theme: China has done a splendid job of turning a communist system into a free-market one. Its prosperity is a result. Just look at the numbers. Of course, the success in our view has been initiated by printing fiat dollars – money from nothing. It is the same “success” that the Western central banks had prior to 2008 and look at how that ended. One cannot grow an economy year after year at nine percent per quarter and expect anything at the end of it but an inflationary depression. 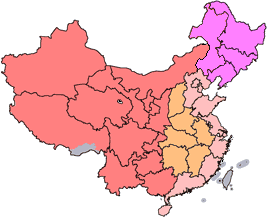 Chinese economic statistics are a case of “garbage in and garbage out.” And Western power elites must be quite aware of what is going to happen in China eventually. In our view it is a kind journalistic criminality that the mainstream media does not do more to alert the West about what is in store. When the Chinese economy crashes, the rest of the world will not be immune. of junk status and instead they have AAA! “Moody’s Investors Service says that the potential scale of the problem loans at Chinese banks may be closer to its stress case than its base case, according to an assessment that the rating agency conducted following the release of new data by China’s National Audit Office (NAO). When considering the apparent absence of a clear master plan to deal with this issue, Moody’s also views the credit outlook for the Chinese banking system as potentially turning to negative. “We assume that the majority of loans to local governments are of good quality, but based on our assessment of the loan classifications and risk characteristics, as provided by the NAO and other Chinese agencies, we conclude that the banks’ exposure to local government borrowers is greater than we anticipated,” says Yvonne Zhang, a Moody’s Vice President and one of the authors of the report. Liar, Liar, European Pants on Fire! (Reuters/CNBC) S&P Cuts Greek Rating; Moody’s Warns of Downgrade – … Standard & Poor’s slashed the nation’s rating to B from BB-, while rival agency Moody’s announced that it put Greece on review for a potential downgrade of its current B1 rating. “In our view, there is increased risk that Greece will take steps to restructure the terms of its commercial debt, including its previously-issued government bonds,” S&P said in a statement, warning that more downgrades could come. It said its projections suggest that principal reductions of 50 percent or more could be needed to restore Greece’s debt burden to a sustainable level. Greece, whose fiscal slippages triggered Europe’s debt crisis, is rated junk by all three major rating agencies. [BoomBustBlog research considered Greece junk a year before all three ratings agencies took appropriate action.] Moody’s placed Greece’s B1 sovereign credit rating on review for a possible downgrade after the country revised upward its general deficit for 2010, increasing uncertainty about the sustainability of its deficit. Moody’s said a multi-notch downgrade is possible if it concludes that Greece’s debt metrics are on an unsustainable path. “In Moody’s view, such conditions would materially increase the risk of debt restructuring over the short to medium term,” the agency added. “Fitch rates Greece at BB+ with a negative outlook. The agency does not comment on market speculation,” it said in a statement. European Officials to Revamp Greek Aid: European officials are preparing to revamp Greece’s bail-out package after concluding that Athens would be unable to raise money in the markets early next year, as envisaged under a €110 billion ($158 billion) rescue plan. Euro zone ministers this weekend publicly acknowledged that Greece would probably need additional cash from the European Union or other international institutions. We think that Greece does need a further adjustment programme,” said Jean-Claude Juncker, Luxembourg’s prime minister and chairman of the eurogroup of finance ministers. George Osborne, UK chancellor of the exchequer, said changes to the Greek bail-out programme were “inevitable”.Although such a conclusion had been widely accepted by analysts and officials working on the issue, the public recognition marks a turning point in the debate over Greece’s future. For those who feel these analyses are barking up the wrong tree, simply realize that a maturity extension is a restructuring – economically, it is essentially a default. The articles above discuss maturity extensions and/or coupon reductions in the emergency loans given. Would anyone be willing to wager whether or not the bonds purchased by the ECB, et. al. are next up? I say damn near guaranteed. After all, Greece cannot dig itself out of this hole. The hole must be partially filled with the sacrifices of the debt investors who put money into Greece. It’s really as simple as that. This perspective on Greece’s prospects is actually quite optimistic compared to raw calculations and the absence of anything resembling a modicum of credibility, honesty, or the truth! Just before 6 p.m., German news magazine Spiegel Online distributed a report saying that euro-zone finance ministers were convening a secret, emergency meeting in Luxembourg that evening to discuss a Greek demand to quit the euro zone. Calls from reporters flooded in to Guy Schuller, the spokesman for Luxembourg Prime Minister Jean-Claude Juncker, the man who is the head of the Eurogroup council of euro-zone finance ministers. In a phone call and text messages with two reporters for Dow Jones and the Wall Street Journal, Mr. Schuller repeatedly said no meeting would be held. He apparently said the same to other news outlets; at least one more moved his denials on financial newswires. “We had Wall Street open at that point in time,” Mr. Schuller said. As always Reggie is right on the ball .I am astonished that we do not have anybody here in Ireland who does such intensive research and is streets ahead of the so called established experts .Reggie is a breath of fresh air and his gentle manner makes him more compelling .Well done Reggie I count myself to the many new followers you are now collecting in Ireland. With all eyes focused on Japan, it’s easy to miss significant events elsewhere. For example, the sovereign debt crisis is still unfolding in Europe, and the “agreement” in Brussels last week solved nothing even though one might not know it from looking at the Euro. Portugal’s government blamed higher rates paid at a debt auction on Wednesday on the opposition’s refusal to back its latest austerity plans, warning a political standoff could force it to seek a bailout. Portugal’s plight has become yet more complicated by the fact that the main opposition Social Democrats have refused to back the government’s latest austerity plans, which are aimed to ensure the country meets its budget goals. Prime Minister Jose Socrates warned on Tuesday that his minority government would be unable to continue if the country’s long-term economic strategy, which includes the latest austerity measures, was not passed in parliament. “Yield levels in Portugal still trade above their snowball level — where the level of interest charged means their level of debt stock is going up — and that means that longer-term the situation, despite their best efforts, is getting worse not better,” said rate strategist Charles Diebel at Lloyds Bank. The Portuguese, who are facing higher taxes, lower social benefits and a likely return to recession this year, have stepped up protests against austerity. But it was not clear they want a change of government. Moody’s cut Portugal’s sovereign debt rating by two notches to A3 late on Tuesday and said it might have to downgrade again given the impact of high borrowing costs and the difficulty of meeting tough fiscal targets. The yield on Portugal’s 10-year bonds was at 7.67 percent while the spread to safer German Bunds stood at 456 basis points, up from Tuesday’s 446 basis points. Risk premiums hit euro lifetime highs last week. 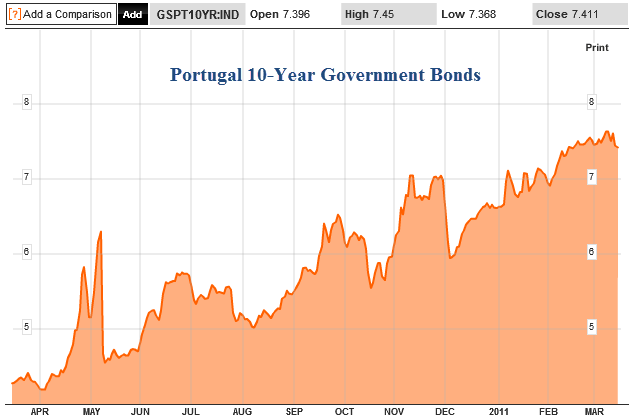 Yields are about 20 basis points below the levels reached last week, but these rates will sink Portugal in due time. Portugal will need a “bailout” whether or not the country gets it political act together. However, it’s important to note that is it not really Portugal that will be bailed out, but rather German, French, and UK banks (just as with Ireland and Greece). The Irish public have been deceived ,they thought were voting for change but instead they got more of the same for the next two years according to the new governments 5 point plan . When these two years are up we will be utterly brook and the rats will then leave the ship when nothing else is left for them to take .Our airports will be privatized, our ports, our natural resources and our roads will be sold off along with the ESB, Board na Mona, board Gas and maybe our forests too .We might then stand up and make the changes our political masters won’t make!